Secondary structure plots of CXC chemokines. The ExPASy program, ProtScale (http://expasy.cbr.nrc.ca/cgi-bin/protscale.pl) was used to compare the charged residues profile (top) and hydrophobicity indices (bottom) of IL-8 (dotted lines) with ENA-78/CXCL5 (A), MIG/CXCL9 (B), I-TAC/CXCL11 (C), IP-10/CXCL10 (D), or lymphotactin/XCL1 (E) (solid lines). Residue position number corresponds to the alignment of the N-terminal cysteine region of each chemokine with the N-terminal cysteine region of ENA-78/CXCL5, with “1” depicting the first residue of ENA-78/CXCL5. The C-terminal highly cationic ∼35 residues, which are putative antimicrobial regions of MIG/CXCL9, I-TAC/CXCL11, and IP-10/CXCL10, are represented by a solid thick line. The antimicrobially inactive lymphotactin is also highlighted (thick solid line) to indicate lack of charged residues in its C terminus. RDAs demonstrate antimicrobial activity of ELR− CXC chemokines. 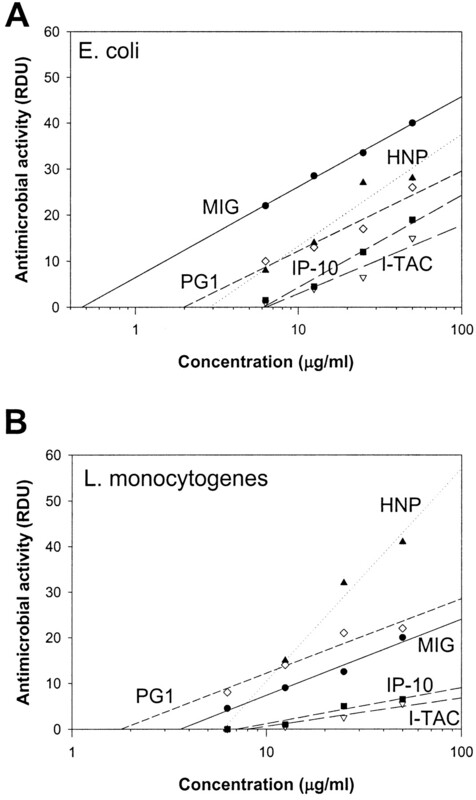 Using RDAs the antimicrobial activity of MIG/CXCL9 (•), I-TAC/CXCL11 (▵), IP-10/CXCL10 (▪), HNP-1 (▴), and PG1 (⋄) were tested in 10 mM sodium phosphate, pH 7.4, against E. coli (A) and L. monocytogenes (B). The MIC is indicated by the regression at the x-intercept for each polypeptide tested. 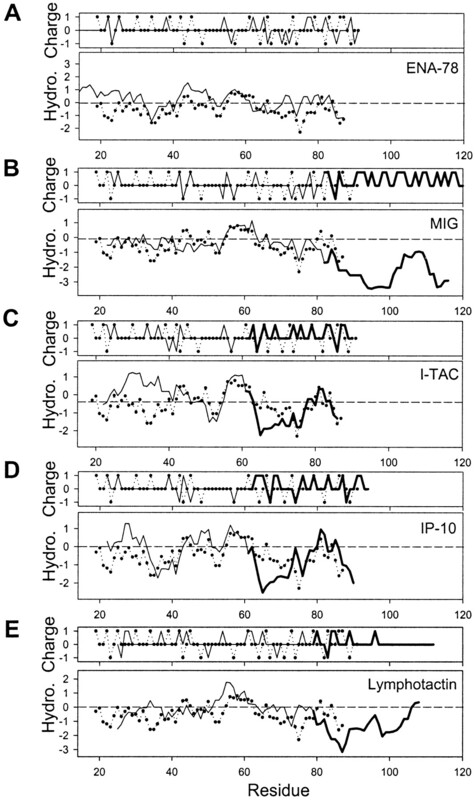 Levels of MIG/CXCL9 and IP-10/CXCL10 are elevated in IFN-γ-stimulated PBMC. 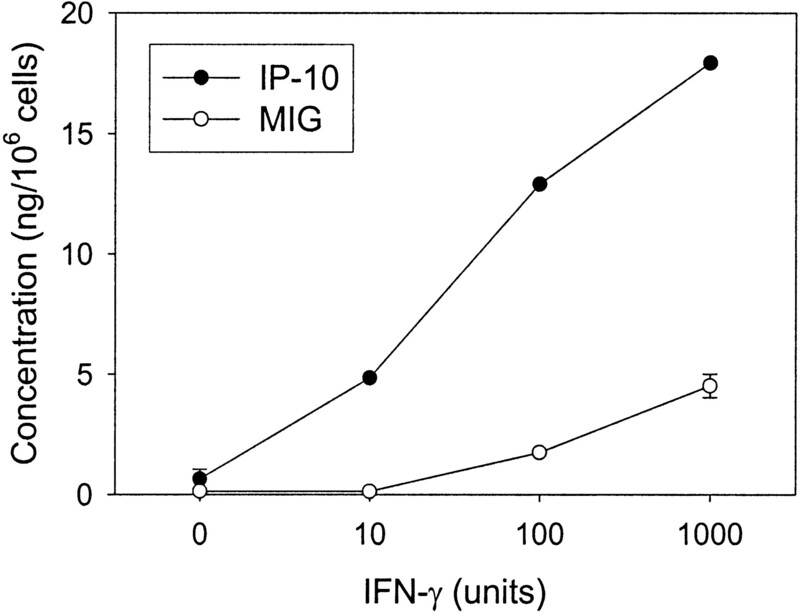 MIG/CXCL9 and IP-10/CXCL10 were measured by specific ELISA from untreated and IFN-γ-treated PBMC culture medium and normalized to nanograms per 106 monocytes (n = 3 donors in duplicate for 0 and 1000 U IFN-γ). Error bars represent SEM. a A negative value (−) indicates that chemokines were not antimicrobial even at 50 μg/ml as measured by RDA. a MICs correspond to the x-intercepts of plots of RDAs such as those shown in Fig. 2⇑. Effective chemokine MICs are shown in bold. b Regression analysis was not possible for plots with only two points, and MIC ranges are given for these samples.